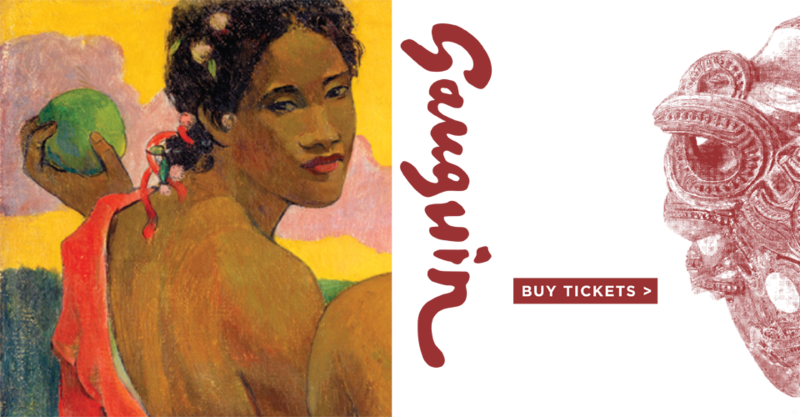 the distinctive feature of the exhibition is its juxtaposition of Gauguin’s paintings (presented chronologically) with Polynesian sculpture and artifacts. This is surprisingly effective, as one passes from a room of paintings to a few artifacts, more paintings, an entire room of Polynesian objects, a room of woodblock prints, and so on. 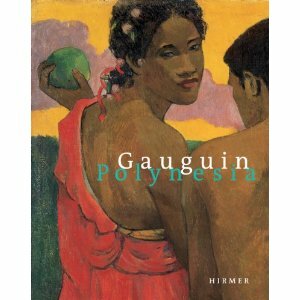 I wasn’t entirely convinced that I would want to see a show of 60 Gauguins, but the alternation helps to keep one’s eyes fresh and one’s interest piqued. Plus, the opening lecture oriented us well. Many of the objects were already familiar, allowing us to examine the art without fussing with the signs or bothering with the accompanying audio headsets. Of course, it was late, we were hungry (those hors d’ouevres not quite adding up to a complete dinner), and I didn’t want to be out too late. So we didn’t give the show its due. We got a pretty good overview, which had to do. We have until the end of April to return for a closer examination. And we will. We found ourselves in danger of not returning for that closer examination, what with our trip two weeks ago and the show closing in another week. We were down to the final two weekends, during which the show will be mobbed. But, by chance, we learned at the beginning of last week that for museum members at a suitable level (like us), it was possible to write ahead and ask for special entry at 9:15 on a Tuesday or Thursday morning, before the 10:00 opening of the museum. I wasted no time requesting entry for this past Thursday. We got the okay and headed downtown first thing in the morning. As instructed, we entered by the volunteer door, signed in with security, then waited for a museum staff member to meet us. She brought us up to the exhibit, walking us through part of it in order to get to the start. Along the way, we passed a whole class of students being led on a tour. They looked high school age, about thirty in all, and had a one-room head start on us. Other than them, we had the place to ourselves. The woman who brought us up also got us some audio guides to use if we wished. We worked our way through the exhibit at a slow pace, always being sure to hang back from the tour group. Over time, a few other singles and pairs arrived, moving past us and beyond the group as well. We were content to take our time. As for the audio guides, they were painful to use. When a painting or object is marked as available on the guide, one presses the three-digit code, then a man comes on to state the obvious, and slowly. The painting’s name, year, size. What’s in it — a red figure left of center, a yellow field, on and on. There was no way to skip past this. Only when he was done would he offer to have you push the play button so you could hear a commentary. He returned to say a few words, then offer curator Pam McClusky for a few words of comment. After she was done, he would make more remarks, then give the stage to her again. Forget it. The pity is, this was the rare occasion when we could plant ourselves in front of a painting, listen to the guide, and not be in anyone’s way. (Surely this is the worst feature of these guides — the natural tendency of the listener to stay put, listening perhaps without even looking, letting time pass, acting as a blocker to all others.) But so little information was forthcoming, all the more given the high quality of the explanations on the walls. Well, no matter. It’s a wonderful show, and we were privileged to see it on our own. I did tire of that tour group, with the guide talking non-stop. She was loud, slow, and clear, a gem of a guide for those in the group. For me, it became an increasing nuisance, like trying to read a book when someone has a TV or radio on with non-stop talk. Only when we got to the penultimate room, holding back while the tour group finished up in the last room — the guide talking about one final painting, then about Gauguin’s career as a whole, then taking questions — did I finally lose patience and join the group. And only then did I realize what should have been obvious all along: that the guide was none other than Pam McClusky. Not that it was our place to tag along, but we surely would have learned a lot if we had. Forget the audio guide, with occasional remarks by her. We could have had her non-stop, the very non-stop chatter that had been a distraction when I tried to ignore her, but could instead have been a joy. What I really wished is that we had chosen a day when there was no tour. But maybe the deal is that she has been leading tours of the exhibition every Tuesday and Thursday before opening hours, which is why the space is open and available to a limited number of members as well. I suppose that’s about all I have to say. I would have wished to insert photos throughout the post of our favorite paintings and objects, but photography wasn’t permitted, and there’s nothing at the exhibition website either. If you’re in the area, be sure to see the show in the next week. Otherwise, consider getting a copy of the book, one of which we brought home with us.